One of key oil and gas operators conducted offshore coiled tubing operation to isolate the bottom plug prior to perforate and produce from new zone. The operator deployed 1 ¾” tapered coiled tubing had stuck at 3488m. After multiple attempts to free the coiled was unsuccessful. Series of operation meeting has been organized in town with multiple parties to ensure the success of operation. The objective was to cut and retrieve the coiled as deep as possible to save the upper reservoir zone. The free point depth was not able to be determined due to highly deviated well. Based on the Remote Firing Mechanism’s (RFM) pressure and temperature log, the recorded temperature was at tool operating limit. Following the logging run, a puncher run was initiated to establish fluid circulation below the cutting point. The activation parameter of tools has been set accordingly to allow safe and activation of puncher and cutter downhole by battery. As a result, the 1.75” coiled tubing has been cut free by 7/8” RCT cutter safely and produce clean cut without any swell. 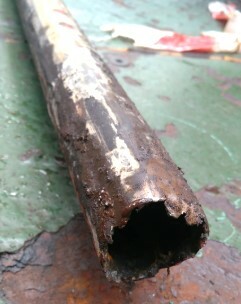 It was found traces of cement at the one side of the coiled tubing when it recovered to surface. The success of this operation enable the operator to move forward to perforate the and produce from this reservoir.